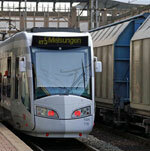 3 June 2009: Interest in deploying the tram-trains concept is growing across Europe during the present period. As all tiers of government grapple with the challenges of beating congestion whilst also cutting carbon emissions this approach, which combines proven technologies, is attractive. By combining heavy rail routes with tramways they allow passengers to access key destinations in city centres from suburbs without making a change and attract people who previously used cars thus cutting congestion and emissions. Germany pioneered the utilisation of combining heavy rail and street running fixed link systems but in the last few years there has also been an upsurge of interest elsewhere. Several schemes are in the construction phase in France and a trial is underway in the UK. “The trial is being conducted in a way which can provide the learning for planning and delivering reliably on schemes anywhere in the UK,” she said. The trial routes are in Yorkshire and are those, which connect Sheffield with Huddersfield and Rotherham. These two lines share tracks between Sheffield and Meadowhall. During phase 2 of the trial services will leave this busy corridor and connect to Sheffield’s street-running tram system. “We needed a route which includes a passenger only section, sections with some inter-operability and a location where we could get on to the street and operate as a normal tram,” said Mottram. Stadler, Alstom and Siemens vehicles are already on the market so it seems manufacturers are confident of a niche in mainland Europe. With a narrower track gauge on the national rail system, the situation in the UK is more fluid. Mottram emphasises that the trial is to test and prove costs and technical operability on the UK rail and street environment. Phase 1 is underway and new tram trains are likely to begin running on the Sheffield-Huddersfield line in 2011. Vehicles can be supplied to operate in dual-mode. Customers can choose between diesel on the heavy rail system with 750DC for street running and the all electric 25KV or 15KV on heavy rail with the 750DC on street. In the UK the diesel option is likely to be essential on many of the likely locations for a scheme. In France, so far, the all-electric option is being preferred. In Nantes, for example, the project promoters who are led by Pays de Loire Region are electrifying the disused rail corridor north of the city to Chateaubriant. It will connect with the tramways in the city to permit journeys from Chateaubriant and the other towns served to the city centre without a change. The first phase from the centre of Nantes to Nort-sur-Edre will open in 2010. The complete service, through to Chateaubriant, will begin in 2013. As in other schemes in France, vehicles capable of speeds of 100 kms per hour on the heavy rail sections are to be deployed. Funding has come from the regional council, the national government, the Department of Loire-Atlantique and Nantes Metropole. 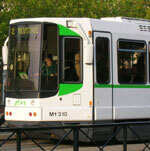 In Lyon, tram trains have been chosen for two new routes. One will link the TGV station at Part-Dieu and Lyon St. Exbury airport to the east and another will serve suburbs to the west. Both will run on electric power on both tracks and street and are likely to open before the end of 2010. The diesel option has been pioneered in Kassel, Germany. The system cost 180 million euros and opened in 2007. It provides a more frequent regional rail service, with additional stations, along three corridors and allows the tram trains to join the city’s tram network at Schiedemann-Platz using a new tunnel from the Hauptbahnhof (central station.). The ten hybrid diesel electric and 18 dual mode electric vehicles in Kassel are manufactured by Alstom and are branded as Regio Citadis Dualis. The funding came from a mix of Federal, Regional and Local Authority shares. In Braunschweig, Germany, a scheme with an estimated cost of 233 million euros is planned. This will use third rail technology to allow vehicles to run over the standard 1435mm gauge tracks on the rail network and on the city’s tramway network, which has a 1100mm gauge. The new services will provide high frequency connections to Salzitter, a town of 100,000 population to the south of Braunschweig, as well as direct journeys on-street from the central station to the city centre for travellers from the south east and northern suburbs. Although the finance was still being finalised in early 2009 work is expected to begin in the same year. Funding is likely to include 60 per cent Federal government and 22.5 per cent Niedersachen Land (Lower Saxony State) contributions. Issues likely to determine the extent of spread of this useful addition to the public transport portfolio include cost, safety and environmental efficiency. Perhaps the most exciting opportunity for municipalities is that it makes the creation of projects for short sections of tramway potentially highly viable. Delegates at this year’s ACORP (Association of Community Rail Partnerships) event heard that vehicles were likely to cost more than conventional train or tram alternatives as they included a lot of complex parts. Costs could be as high as five million euros for each set. But the benefits could outweigh this as well as providing existing users with higher frequencies and modern environment’s. He said that the vehicles in Kassel used a lot of fuel and were heavy which impacted on track wear but that in areas where there was not support for electrification of heavy rail routes they were an attractive alternative. In Kassel, the system has opened up several development opportunities along the corridors and in the city and has restored the role of the central station, which had been diminished since the edge of city station Kassel -Wilhelmshöhe opened on the new high speed rail line in the 1990’s. It took a long time and the personal commitment of a president of the United States for the concept of travel to the moon to be made a reality, and there were many who doubted it would ever happen. Personal rapid transit (PRT), also called Personal automated transport (PAT), has had a similarly long gestation, and the concept was perhaps oversold in the 1960s when, in the UK, drawings were published of clumsy elevated structures cutting through Central London and looking almost as intrusive as the six-lane expressways to which they were claimed to be an alternative. The promises made about PRT in those early days still blight it today, and there are many transport planners who will give a wry smile when told that the first PRT system will come into service over the next year at London’s Heathrow airport.